China Beat will be running a series of 2008 retrospectives over the coming weeks--pieces that both look back at events of the year (some well-trod ground, others largely unnoticed) as well as tying those earlier events into on-going trends and situations. In this piece, Jennifer Liu reflects on Taiwan's 2008 Olympic experience, memories of which take on a different hue in light of Taiwan's tumultuous autumn. Olympic fever still hasn’t waned in China (especially in Beijing), but when I was living in Taiwan this summer, it seemed Olympic excitement had already run its course or maybe it never even took off. While China was gripped by Olympic fever, its “rogue province” took a much more detached attitude to the proceedings. According to Nielsen’s ratings, China, along with South Korea, had the highest rate of viewership for the Games – 94 percent of the total population watched some portion of the Olympics. Ratings in the U.S. were an impressive 69 percent. But in Taiwan, none of the cable channels even broadcast the Olympic Games – only the opening ceremony was shown. Furthermore, the single sport the Taiwanese seemed passionate about was their national one: baseball. 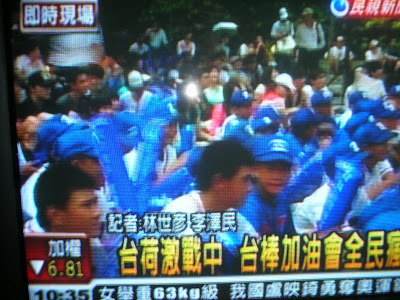 Baseball alone rallied Taiwanese crowds in similar ways to the Olympic excitement across the Straits. 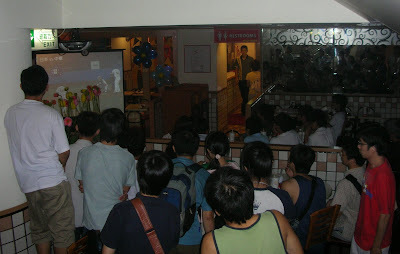 For Chinese Taipei’s first game against the Netherlands, the McDonald’s located on Xinsheng nanlu (across from National Taiwan University) provided patrons with a large screen showing the entire game. The fast food restaurant also gave each spectator (many of whom had eagerly lined up for hours outside before the game began) red thunder clappers and a free hamburger. At the Shinkong Mitsukoshi (新光三越) department store complex near Taipei 101, cheerleaders rallied the crowd. Some fans symbolically ate poached eggs (荷包蛋, hebaodan) – the Chinese word not only sounds like “Holland posting a zero,” but further implies it since an egg is shaped like a zero. The phrase was also a play on the notion that the Chinese Taipei team was going to “bomb” Holland, and indeed it did in a 5-0 victory. The next game was against Japan. I went to the same McDonald’s to watch (this time, no thunder clappers or free hamburgers), and unfortunately, the Chinese Taipei team suffered a crushing 1-6 defeat to the Japanese. Nonetheless, the Taiwanese were confident their team would win in the next day’s game against China. That wasn’t the case, and many were shocked and dejected when China, not known to excel in baseball, upstaged Chinese Taipei 8-7. Hidden beneath the baseball scores and unfortunate losses, however, was a strange turn of Olympic scheduling: Taiwan’s first three games were all against countries that have a share in the island’s complex history. The Dutch colonized Taiwan in the early seventeenth century until Zheng Chenggong (Koxinga) expelled them from the island in 1662. After a Chinese armada defeated Zheng’s grandson, the Qing dynasty annexed Taiwan and placed it under the jurisdiction of Fujian province. Following its defeat in the Sino-Japanese War, the Qing ceded Taiwan to Japan in 1895. After fifty years of Japanese colonization, Taiwan experienced a “glorious return” (光復) to China at the conclusion of World War II. However, some argue that when the Guomindang retreated to Taiwan and set up an authoritarian regime, its rule was also a form of colonization. As Susan Brownell wrote about earlier this year at China Beat, sports have long been a form of communication between Taiwan and the mainland – the competition between the two entities has mainly been good-natured, yet sometimes fraught with tension. I wondered then what went through the minds of the Taiwanese, especially when their team was defeated by both Japan and China. On the one hand, although the Japanese colonized the Taiwanese and treated them as second-rate citizens, many of them still admire and imitate Japanese culture today (for instance, Taiwanese youth prefer to visit Japan over the U.S.). On the other hand, many Taiwanese resent China’s heavy hand, leading frequent mass protests on the streets against President Ma Yingjou for his “friendly” policies toward the mainland. When Ma allowed direct flights between China and Taiwan, the media reported negative stories of mainlander tourists who escaped from their tour group. One television report chastised seven mainlanders who went to Shilin Night Market, ordered one oyster pancake between them, then demanded seven chopsticks (providing a stereotypical example of how mainlanders are cheap). This week Ma took another dramatic step in improving relations with China as a way of reviving Taiwan’s tepid economy, as well as building the island’s long-term security and fostering peace with the mainland. Starting on December 15, direct, regularly-scheduled passenger flights from Taiwan and China finally commenced (flights have been ongoing since July, but not daily – only tourist-group charters on weekends and holidays). Under the landmark agreements signed last month, the number of passenger flights was increased to a maximum of 108 per week, up from 36. Furthermore, the two sides launched the first direct postal and shipping links across the strait. After the Guomindang retreated to the island, it gradually limited the flow of mail to the mainland before completely restricting communication in 1954. With the restoration of the “three links” – direct air, shipping, and postal – these connections end the tedious and costly practice of routing passengers, goods, and mail via a neutral port – usually Hong Kong or Macau. This breakthrough under Ma’s leadership occurs at the same time that Taiwanese prosecutors are indicting former President Chen Shui-bian and thirteen others, including his wife, son, and daughter-in-law, on graft charges and money laundering. Chen had been detained since November 12 on suspicion of corruption, but was released without bail on December 13 around 1:00am to prevent immediate commotion and protest. Taiwanese critics assert that the chief judge who released Chen is a closet DPP supporter because of his decision. Meanwhile, Chinese media are mum on the subject for fear of taking sides and facing accusations from the DPP that mainlanders favor the GMD. Nonetheless, Chinese are paying close attention to the trial, devoting large amounts of news coverage in hopes of using it as an example of how government corruption should be dealt with in their own country. Thus, despite the “three links’” potentially increasing harmony between both sides, suspicions still remain. Likewise, even though observers deemed the Beijing Olympics a major success, no one has noticed that the Taiwanese consumed the Games with much less enthusiasm than mainlanders. Jennifer Liu is a Ph.D. candidate at the University of California, Irvine. Why not "Kuomintang" instead of "Guomindang"? After all, it's their official spelling. "I wondered then what went through the minds of the Taiwanese, especially when their team was defeated by both Japan and China." People here expected the loss to Japan, and were humiliated by the loss to China, which was completely unexpected and demoralizing. People even accused the coach of throwing the game intentionally. Meanwhile, Chinese media are mum on the subject [of judge replacement] for fear of taking sides and facing accusations from the DPP that mainlanders favor the GMD. Nonetheless, Chinese are paying close attention to the trial, devoting large amounts of news coverage in hopes of using it as an example of how government corruption should be dealt with in their own country. And the coverage of the trial in China is aimed largely at demonizing Chen; the mere suggestion that officials at the highest levels of the CCP should be on trial would be criminal, even if some of the more independent media may be hinting something to that effect. On Taiwan travelers preferring a visit to Japan rather than the US, one may also consider that Japan is only a two hour flight away versus 13 hours to the states, with the latter often including a change of plane at Narita anyway. The flight to Japan costs a lot less, too. Then, Japanese Language includes Chinese characters (Kanji) and makes it easier to adjust. Lastly, post 9-11, granted it definitely is harder to visit the US. Maybe that will change when President Obama takes office so that our Taiwan brothers and sisters can come on over for a visit now and then. Thanks for your comments. You make very good points. I choose to use "Guomindang" instead of "Kuomintang" because my dissertation also examines the pre-1949 Party/state while it was still on the mainland.